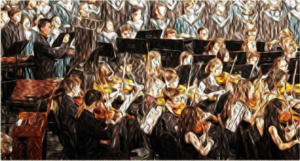 The 2019 HS All City Honor Choir, Band, and Orchestra Concert will take place on Saturday, February 23 at the North Salem HS auditorium, from 7:00 to 9:30 PM. The auditions will be live and will take place on Tuesday, January 15, 2019, at South Salem HS, starting at 4:00PM. Audition material will include the scales from the All State Audition, an excerpt from one of the concert pieces, and sight-reading. Will McLean will communicate specifics via email to directors. The application contract form will be done via Google Form. A link to the form can be accessed on the district music website (salkeiz.k12.or.us/music). If you wish to include the application link on your own webpages, it is www.tinyurl.com/skallcity. The application window will be Monday, Dec. 3 through Tuesday, Jan. 8. If a student fails to apply by the deadline, s/he may be accommodated as a walk-on at the live auditions, provided there is time. Will McLean will collect necessary information from walk-ons and will submit the information to Sheila. The selected All City Honor Choir roster, including alternates, will be submitted no later than January 16. All Salem-Keizer HS choir directors will be involved in the audition process as well as the section coaching, as communicated by Will McLean. They will also share in the supervision of the students at the All City rehearsals and performance. The music is to be memorized by the first rehearsal with the clinician (Thursday, February 21).